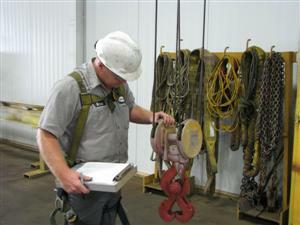 CraneWerks offers a variety of crane and hoist inspection options to meet your individual needs. Whether it is a basic frequent or periodic inspection or a complete inspection and preventative maintenance program; CraneWerks has an experienced inspection team to get the job done. Why perform crane and hoist inspections? 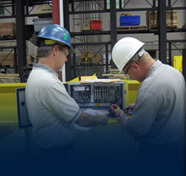 Fully inspect and test your equipment to OSHA regulations, ANSI/ASME and ASTM Standards. Prepare a written report on the condition of each unit. If appropriate, provide a list of recommended repairs. OSHA Regulations 1910.179, Overhead and Gantry Cranes. Appropriate ANSI/ASME Standards for Overhead and Gantry Cranes and Hoists. Our service technicians will check the hoisting and traveling drives, the general condition of the runway rails, electrification and controls. They will test the equipment, inspect all mechanical and electrical parts that are visible, and identify any items that need replacement. At the completion of the service, one of our service technicians will discuss the results of the inspection with the appropriate representatives of your organization. In addition, you will be provided with a written report for each lifting system. Inspect and test the hoists, trolleys, and cranes for proper operation. Inspect the motor brakes for proper operation. Visually examine the sheaves, drums, wheels, and bearings. Visually examine the hoist cable or chain for kinking, crushing, cutting, or corrosion. Insure that the hoist reeving is correct. Inspect the end stops, bumpers, and rail sweeps. Inspect the collector shoes, brushes, and wheels for signs of arcing and wear. Inspect the external motor couplings and wiring for wear and deterioration. Visually check the electrical control enclosures for broken or loose connections and proper operation. Examine the hooks for wear, bends, and cracks. Insure that the safety devices are not missing. Inspect and test the safety devices such as lights, horn, and limit switches. Please fill out out Inspection Form for more information. Visually examine the sheaves, drums, and wheels. Please fill out our inspection form for more information. View an example of our inspection form. CraneWerks, Inc. can create a custom preventative maintenance program specifically for your equipment. This program would be designed to inspect, perform routine maintenance and scheduled repairs in order to prevent equipment safety issues, breakdowns, and compliance violations. By performing preventative maintenance on your equipment we can lower costs by eliminating emergency service calls and production down time. Remember the importance of inspecting your come-a-long and chain fall hosts. 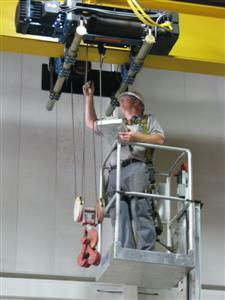 CraneWerks can inspect these hoists on site or inspect and load test them in our shop. CraneWerks, Inc. will perform a NDT (non-destructive test) of the hooks in order to uncover any fractures that are not visible under normal conditions. This will include the thorough cleaning of the hooks and the use of a magnetic particle test or dye penetrant test. The inspection will be performed to ASTM Standards. CraneWerks, Inc. hast the ability to conduct operator training and frequent (monthly) inspection training classes for operators and maintenance inspectors in either your location or at the CraneWerks facility. Call 888-544-2121 to speak to one of our qualified crane and hoist inspectors or submit a request online for more information concerning crane and hoist inspections, preventative maintenance programs, load tests and training.